"...the screen is my canvas"
Ameli Neureuther is a member of the famous Mittermaier-Neureuther family and just as athletic as her renowned brother, ski pro and Bogner testimonial Felix. Despite that Ameli has chosen arts over sports and works as designer, illustrator and artist. She learned her skills directly from designers such as Marc Jacobs and Karl Lagerfeld. For Fire + Ice Ameli has designed an exclusive capsule collection consisting of ski underwear with bold designs and patterns. She designed all layouts on the iphone with her finger. „My finger is my brush and the screen my canvas“, she explains. Famous athletes such as freeskier Sven Kueenle, snowboarder Amelie Kober, Slalom pro Felix Neureuther, Skier Viktoria Rebensberg und Freeskier Benedikt Mayr have inspired Amelis designs. They also showed their support by uploading a picture with them wearing a shirt which Ameli exclusively designed for them on Instagram. 1. You create app art. What exactly is that? App art is produced on an iphone. My phone is always with me and it allows me to draw whatever comes to my mind. 2. 2. The idea behind the collaboration? The lead idea was to produce sketch book like shirts for different athletes. 3. 3. Shortly describe our athletes. Vicky Rebensburg, one of my favorite athletes – very cool. Bene Mayer, the most handsome free skier since the invention of chocolate. Everyone loves Amelie Kober – that’s why she gets all the kisses (on the shirt). Sven Kueenle – sunny boy, free skier, nature loving, a bit nuts. My brother Felix is very competetetive. His motto „no snow, no show“ had to be on his shirt. 4. How would you describe yourself and your work? In a way I feel like a butterfly who flies from one flower to another. The artworks are a mix of popart, cartoon and sketchbook styles with spot on details like kissing lips for Amelie Kober, flower showers for Viktoria Rebensburg, ski jumps for Bene Mayer or a modern mountain panorama view for nature loving Sven Kueenle. 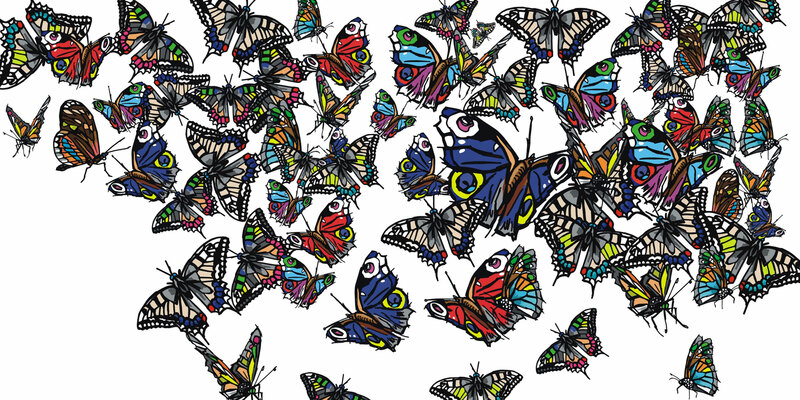 The colorful butterflies on one of the shirts are a reference to the artist herself because Ameli sees herself as freethinker. „Like a butterfly flying from one flower to another", explains the designer who gave her debut at an exhibition called "Appart" in Munich in 2010.